Combine the eggs, mustard, salt and vanilla seeds in a bowl. Using a hand blender, blitz the ingredients together. Slowly add in the oil, a little at a time. When the mayonnaise has emulsified, stir in the vinegar. Cover until needed. Combine all the ingredients for the chili sauce, chopping the thyme leaves before adding to the sauce. Place in the fridge, covered overnight. 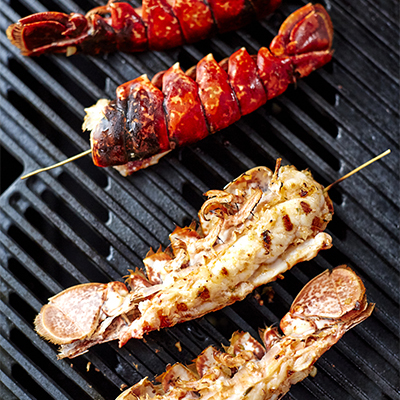 Cut the lobsters in half, lengthwise, clean and place a skewer from the top, halfway through. Season with salt and pepper, then coat with some olive oil. Add some of the chili sauce on the flesh side. Place on a hot grill or BBQ for approximately 2 minutes on each side. Once cooked, remove from the grill and place on a platter. Squeeze some lemon juice over and serve with the vanilla mayonnaise.